The Red Tent. Image courtesy of Showcase. 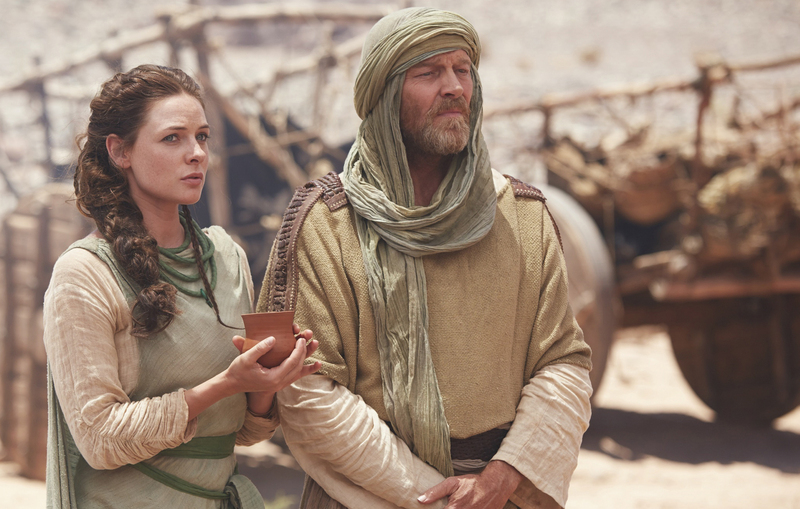 TWO NIGHT MINISERIES EVENT: Sunday, December 7 at 10pm ET/PT and Monday, December 8 at 10pm ET/PT Based on the best-selling novel by Anita Diamant, The Red Tent is the sweeping tale of Dinah, the daughter of Leah and Jacob, who was only referred to in small glimpses in the Old Testament. The miniseries begins with Dinah’s happy childhood spent inside the red tent where only the women of her tribe are allowed to gather and share the traditions and turmoil of ancient womanhood. Told through Dinah’s eyes, the film recounts the story of her mothers, Leah, Rachel, Zilpah and Bilhah, the four wives of Jacob. The saga continues as Dinah matures and experiences an intense love that subsequently leads to a devastating loss, changing the fate of her and her family’s lives forever. Starring Minnie Driver, Morena Baccarin, Rebecca Ferguson, Iain Glen, Will Tudor, and Debra Winger. I grew up Catholic, and so am vaguely familiar with the story of Jacob and his children, the twelve sons who later became the twelve tribes of Israel and the single daughter Dinah. A teacher in sixth grade gave a pop quiz where we had to list all of his children with proper spelling and in the correct birth order — this made such an impression on me that even now, I can still rattle off at least nine out of the thirteen names. Traveling to their new home. Will Tudor as Joseph, Rebecca Ferguson as Dinah and Minnie Driver as Leah. Image courtesy of Showcase. However, I never really knew anything about Dinah beyond a name on the list. It turns out she had a pretty brief, violent mention in the Bible, and typical for Biblical stories, her passage was very much focused on the actions of her brothers and on the significance of her experience to the men around her. That’s why I absolutely loved The Red Tent. A feminist re-focusing of the narrative, Diamant’s tale portrays Dinah as a woman who was raised and moulded by women. Diamant’s Dinah forges her own future and faces the tragic twists in her fate as an individual rather than merely a figure to prompt her father and brothers into action. I haven’t read Diamant’s book, but if the TV miniseries is any indication, the novel is definitely going on my To Read list. Female empowerment is a theme that runs throughout the production. The tent in the title refers to the place where women in Dinah’s tribe stay when they have their period. The original purpose likely had to do with keeping “impurity” away from the men of the tribe, but in Diamant’s story, the red tent is a space of empowerment, where women share stories, celebrate their potential to create life, and secretly worship a goddess whose figure has been handed down from mother to daughter. One of the characters scoffs at how the men in the tribe pity them and their pain, when in fact menstruation is a source of power and cause for celebration.The portrayal of the red tent and the relationships among the women in Dinah’s tribe remind me very much of Margaret Atwood’s The Handmaid’s Tale, where sisterhood is a potent, powerful force even within a patriarchal society. Rebecca Ferguson as Dinah and Iain Glen as Jacob. Shot on location in Morocco, May 2014. Image courtesy of Showcase. Even as an adult, when tragedy takes Dinah away from her family, Dinah’s story is very much intertwined with the women around her. She is very much devoted to her son and men in her life, but the agency remains hers and the strong influences are from the women around her. Her mothers’ teachings remain strong even in into her adulthood, and her mother-in-law and a female friend help shape her future. At times, the women empowerment theme feels a bit heavy-handed, but to be honest, after having her story virtually subsumed by the male-centric Biblical narrative, I say it’s about time. The Red Tent features an impressive ensemble of actors. 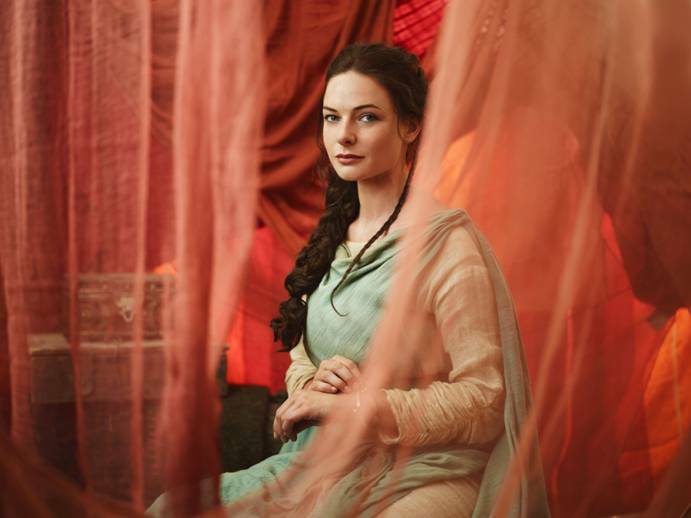 Rebecca Ferguson (The White Queen) is a powerful Dinah. In one scene, she accuses her father of privileging her brothers over her, because “I’m only a daughter. Only property.” Her bitterness is palpable, her voice hoarse with uncontrolled fury. Dinah’s biological mother Leah is played by Minnie Driver, whom I loved in Good Will Hunting, and who brings an earth mother type wisdom to the role. Driver’s cast bio begins “Audiences may not know where Driver’s next character calls home, but they can be sure that no matter where it is, British-born Driver will make her authentic.” I agree. 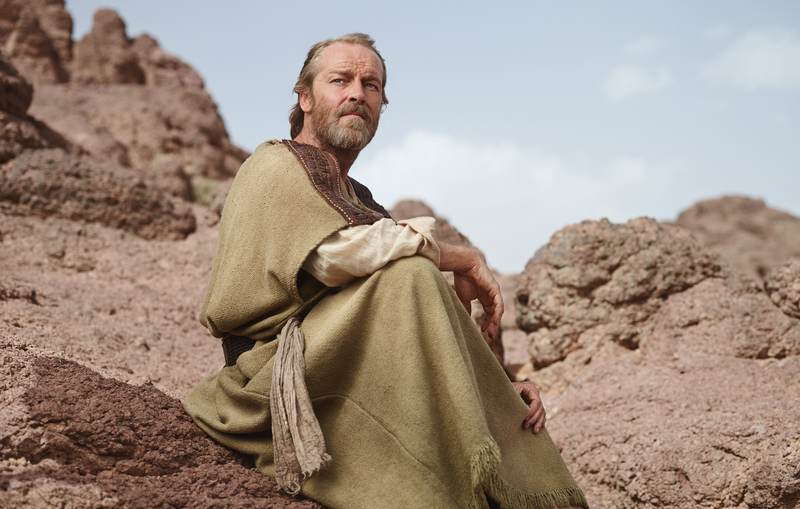 And finally, I have to fangirl over Iain Glen as Dinah’s father Jacob. Glen’s filmography is long and illustrious, but I know and love him best as Jorah Mormont on Game of Thrones. After being so totally rejected by Daenerys, it’s nice to see him have four women in love with him in Red Tent. Seriously though, I love his work in Game of Thrones, and he makes an appealing Jacob — torn between his need to make his legacy strong and his desire to do what’s right for his daughter. The Red Tent is a powerful story, a much-needed woman’s voice making her story heard through the centuries of patriarchal history. Originally a novel by Anita Diamant, it premieres tonight at 10 ET/PT as a two-part TV miniseries on Showcase. + Thank you to Showcase for a screener of this show in exchange for an honest review. This entry was posted in Non-Book Review Posts and tagged Anita Diamant, Books to Movies, Books to TV, Dinah, Showcase, The Red Tent by Jaclyn. Bookmark the permalink. Great review! I was interested in watching the mini-series because it looks goregeous. I’m looking for biblical-themed books or stories for the holiday season, but now I think I might just go for the book! Thanks! I haven’t read the book myself, but the mini-series was indeed gorgeous! 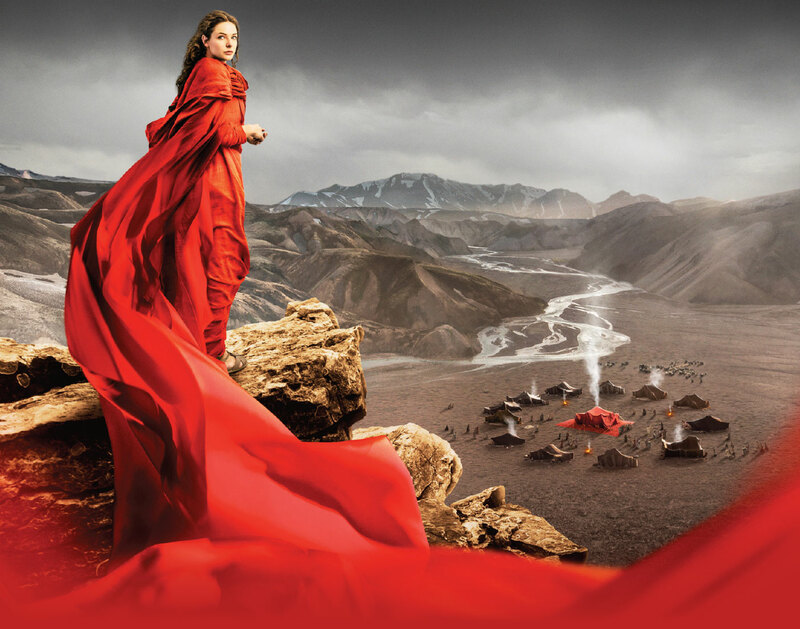 It seems like an interesting novel and probably the TV miniseries must be captivating as well, and the picture showing the red dress girl and the red tent are powerful images which together your review, compel us (in a good way) to watch them. Thank you.